Many production lines use industrial bench scales for many different kinds of functions. They are used throughout the food industry for portion control. As a variety of pre-packaged meals are assembled, the scale can provide information to the worker that allows the correct amount of each course to be properly arranged. Packages being prepared for freezing or refrigeration must be weighed for accuracy. If too much product is filled, it could impact the profitability for the company. It is critical that enough product be packaged to meet labeling requirements. 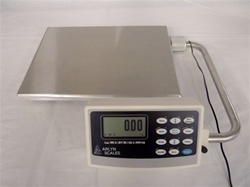 A bench scale is also an ideal method to check weigh a finished package. In situations where a number of items are supposed to be inside the package, the scale can clearly determine if either an extra part has been packed, or if anything has been missed. If the scale is equipped with the correct interfaces, it can send acceptance or failure signals to actuators to allow the package to continue to its destination, or to be flagged for inspection. Formulation may be performed accurately and easily with a digital bench scale. When there are a number of ingredients, they be dispensed sequentially onto the scale platform. This may be done manually by an operator, or automatically. Ideally, the scale can retain a large number of different recipes in memory. As the correct recipe is retrieved, the scale can set its output signals to control feeder devices or valves for dispense. Electronic scales that are used for these purposes should have features that allow them to work reliably in these types of environments. The most common cause of scale failure is the failure of the load cell. Usually, this occurs if something is dropped on the scale, or it loads that exceed the scale capacity are placed on the platform. Another common cause of load cell failure is if the scale itself is dropped. The most popular material used for building load cells for bench scales is aluminum. Unfortunately, this material is quite prone to this type of failure. If the load on the aluminum load sensor exceeds its rating, it can cause elastic deformation of the material. Once this occurs, it is usually impossible to repair it, and the entire sensor would need to be replace. Some manufacturers use plated steel load sensors instead of aluminum. While this is an improvement, it is still not ideal. The best solution is to use stainless steel for fabricating the load sensor. While it is more expensive, and harder to machine, it delivers superior performance. Some of the best industrial bench scales, including the Arlyn Scales models, use this material as a standard. Some added benefits of the stainless sensor include much better water resistance. The Arlyn bench scales provide an additional silicone coating on the load sensor for even better performance in a wet environment. The scale will also be more successful in operating in areas where there are harsh chemicals. The stronger stainless steel sensors also allow the scale platform to be larger, and to have a lower height, making it easier for an operator to place heavy loads onto the scale platform without too much lifting. The digital display is another important scale feature. Ideally, the numbers should use a graphics format, allowing them to be big and bold, and easy to read from a distance. A graphic screen also allows for a friendly user interface, that can provide messages and instructions to the user. While advanced features are useful, if a user has difficulty understanding the scale operation those features will become a liability. Speed of operation is yet another important specification. Some bench scales may require too much time until the updated weight appears on the screen. Again, stainless steel load sensors provide the added benefit of being made from stronger material. If properly designed, they will provide additional stiffness, and the display weight will stabilize more quickly. A wide variety of communication connections will allow the industrial bench scale to communicate with different types of equipment. Some popular digital interfaces include USB, Ethernet, RS-232 and RS-485. Some process equipment is still looking for the analog 4 Ð 20 ma output signal. Again, the Arlyn Scales bench scales provide a choice of any of these output standards.